More than 1,000 British tourists on a round-the-world cruise were ushered to safety amid fears their ship was being followed by pirates, a travel company said Thursday. 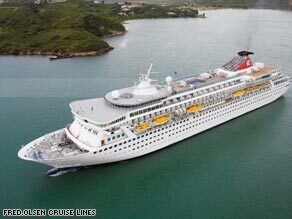 A spokeswoman for Fred Olsen Cruise Lines told CNN that the Balmoral made emergency calls Wednesday after two small craft were picked up on radar in the notorious waters off Somalia closing at high speed. However, she emphasized that at no time was the vessel “under attack”, and there were no visual sightings of “armed pirates.” “Searchlights were directed at the approaching craft and flares used to indicate that it had been observed,” the company said in a statement. “It is possible that this was interpreted as gunfire, but Fred Olsen Cruise Lines can state categorically that there was no gunfire and that although the approaching vessel got to within 400 meters of Balmoral it left the area without incident, and because of the darkness it was not possible to identify the vessel or its occupants.” As a precautionary measure, the ship’s Master “implemented aggressive maneuvering at 1945 local time,” before contact was made with the EU Coalition Task Force — which monitors a protected shipping corridor in the Gulf of Aden — and passengers were requested to assemble in safe havens. An hour later, an EU warship confirmed the area around the Balmoral was clear, and the alert was stood down at 2123. The company reported that the mood on board was good throughout with no panic or adverse reaction from the passengers. The Balmoral is now continuing on its scheduled journey, with the port of Salalah in Oman its next destination. Fred Olsen, which operates five cruise ships globally, reported that this was the first time one of its vessels had encountered an incident of this kind. The waters off Somalia have become a pirate hotspot in recent years, with over 40 vessels hijacked in 2008 alone, according to the International Maritime Bureau. This has prompted a number of countries to send warships to the region in an effort to combat the problem.